In its recent special report, Freedom exposed the dangerous and often unlawful activities of an insidious presence in America  the Cult Awareness Network. A hate group in the tradition of the Ku Klux Klan and neo-Nazis, CAN attacks the core of American life and liberty  religious freedom. In that story, we told of how the Cult Awareness Network had for years exploited the Jonestown tragedy to further its own anti-religious campaign. CAN spokespersons have claimed Jonestown was a mass suicide, whereas in truth it was a mass murder, with the murderers still unidentified. Mr. Huffs excerpted letter follows. I was assigned with the 3rd Battalion, 7th Special Forces Group, 1st Special Forces Panama. On November 18, 1978, we were alerted by the State Department to rescue American citizens in Guyana. All the information we knew was that a U.S. Representative Leo Ryan and his staff were killed or wounded and American lives were in danger. Within five hours of the request of the U.S. embassy in Georgetown, Guyana, and the State Department we were on site in Jonestown. For the next 30 days we stayed to return the compound back to the Guyanese government. When we arrived at Jonestown, we were met by the local Guyana Defense Force (six local policemen). We found one elderly woman who had slept through the murders. We saw many bullet wounds as well as wounds from crossbow arrows. There were injection marks between the shoulder blades of adults and in the tongues of small children. We returned the U.S. citizens to Dover, Delaware. Those citizens of other countries were claimed by their governments, except one person from Jamaica, and that coffin was still on the tarmac in Georgetown when we left on December 21, 1978. After sending the letter, Mr. Huff telephoned and provided more detail about the incident. He explained the significance of the 16 suicides  less than 100 American soldiers were involved in the immediate operations at Jonestown. His group of seven Green Berets were the first American troops on the scene, soon joined by other American forces. Those with fatal bullet wounds or arrow wounds had been running toward the jungles surrounding Jonestown. His group found more than 30 people killed by bullets or crossbow arrows. The adults who had not been shot had been killed by injections between their shoulder blades, and the children had died from poison injected into their mouths. This information corroborates the account of Dr. C. Leslie Mootoo, then chief medical examiner of Guyana, included in the Special Report article. Dr. Mootoo personally examined the bodies of many victims and determined that at least 187 had died from cyanide injections in portions of their bodies they could not have themselves reached. Mr. Huff reported that the murderers escaped before the arrival of American soldiers, leaving behind almost $6 million in cash, even more in uncashed checks, and a large amount of personal jewelry. Who were the killers? Freedoms investigation of the matter continues. Readers with additional information are encourageed to send it to Freedom. Letters have flooded in responding to Freedoms Special Report on the Cult Awareness Network and its anti-religious agenda of hate, violence and death. Here are excerpts from a few of the many letters readers sent to government offices, copies of which were sent to Freedom. As a Conservative Republican and a Catholic family man, I am appalled by the fact that such a hate-filled and violent group known as the Cult Awareness Network continues to enjoy a tax-exempt status. ...I implore you to look into this very serious threat to our First Amendment rights as this is not what our founding fathers intended when they declared religious freedom for all. You must cancel their tax-exempt status. Engaging in kidnapping and assault, the Cult Awareness Network and its members mock American justice and offend the sense of decency and honor that is basic to our society. It is time for this group to be investigated, its crimes exposed, its members prosecuted where applicable. I respectfully request that you conduct such an investigation and make the findings public as soon as possible. 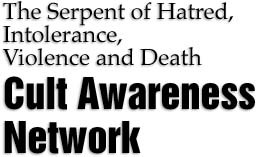 As a law-abiding citizen who very much believes in the constitutional rights protecting our people I find what the Cult Awareness Network is doing as most reprehensible. I feel that the right to choose and participate in the religion of your beliefs is a very fundamental right. On top of all this is the fact that this group fraudulently received in the past a tax-exempt status from the IRS. I am imploring you to take action against this most egregious error and see that it is rectified. In response to requests from our readers, the listing from the Special Report is reprinted here for those who wish to take constructive action regarding the Cult Awareness Network. Cynthia Kisser, executive director of the Cult Awareness Network, and her anti-religious views and actions were featured in the recent Freedom Special Report on the Cult Awareness Network. 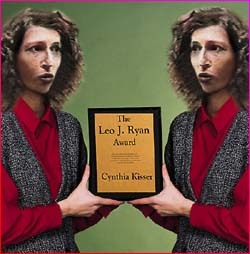 The Special Report received widespread praise from our readership and many readers commented in particular on this depiction of Kisser presenting herself with her own organizations award. Given her groups mounting problems, Kisser apparently wanted to receive it while she still could. Letters have continued to pour in to Freedom and to members of both houses of congress, and agencies such as the Internal Revenue Service. To report criminal activities or abuses or threats by CAN or its officials or members: contact your local police. Submit full information regarding these abuses or crimes to the police in writing and send copies to your states Attorney General listed in your white pages under State Government. 10th & Pennsylvania Avenue, N.W. or e-mail directly to editor@freedommag.org.